In its long lifespan the Chevy Impala has gone from one of the finest American sedans you could buy to one of the worst you could rent back to a car you should definitely consider. What do you need to know before you buy a Chevrolet Impala? Don’t worry, we’ll tell you everything right here in our Buyer’s Guide. The full-sized car space has been feeling the squeeze from increasingly larger mid-size cars on the lower end and increasingly smaller SUVs on the higher end. Why get a five-passenger sedan when you can get a seven-passenger SUV? Surprisingly, Chevrolet’s come up with a product that offers a remarkable value and reasonably choice somewhere in between the two alternatives. Why surprisingly? While the Chevy Impala has a history as being a good value in an attractive package for most of its life, the previous generation’s biggest selling points were that it was big, cheap, and tough. That’s fine for a police car but not great if you want something to take you to work every day. The tenth generation car that went on sale in 2013 changed all that, updating the old platform with a new one that’s shared with more expensive luxury cars like the Cadillac XTS and the short-lived Saab 9-5. The result is a vehicle that feels more refined and comfortable than many of its Japanese and Korean rivals. 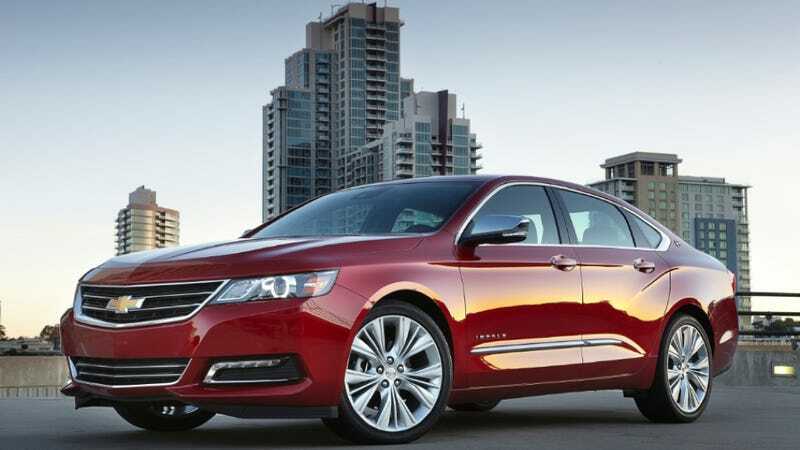 Add in Chevy’s decent MyLink infotainment system, a 305 horsepower optional V6, OnStar, onboard 4G WiFi, and 10 airbags and it starts to become clear why the Impala has done so well. If you’re in the market for a full-size car you’d be dumb not to look at that Impala. Introduced at the 2012 New York Auto Show, the 10th generation Impala has received quite a few accolades since its launch. In fact, at the time Consumer Reports said it was the best sedan they’ve ever tested. So if it ain’t broke, don’t fix it, right? Chevy agrees, so they’ve only made minor changes to that 2014 car. In 2015, Chevy dropped the 2.4-liter hybrid engine that was available for 2014. Now all Impalas come with either the 2.5-liter I4 or the 3.6-liter V6 — both mated to 6-speed automatic. The 2016 model year also brought only minor changes like new exterior colors, the introduction of Apple CarPlay, wireless charging capability, and a new Midnight Edition appearance package on V6 LT and LTZ models.